This is compiled from info gathered from the CBF Head Office, old magazines, old award name plates and John and Ruth Webster’s family files. It was written over 2009 and 2010 as part of the bio to have John inducted into the Canadian Motorsport Hall of Fame by Andrew Fralick. Please note that it was written and John was inducted to the Motorsport Hall of Fame before he passed away of cancer in 2012. 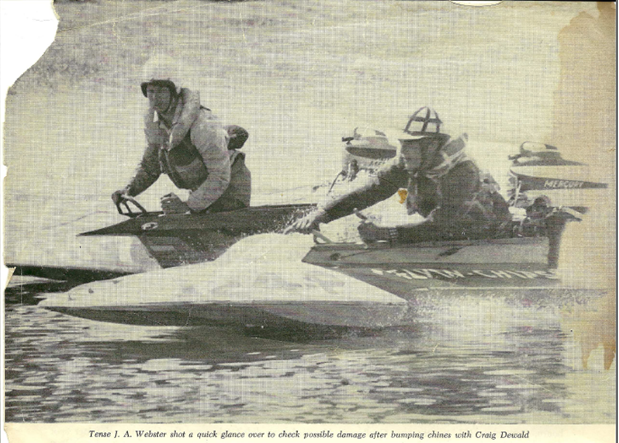 Please read on about John Webster’s highlights and career in powerboat racing. 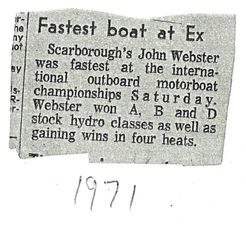 I am not a great writer, but will try to convey Webster’s unparalleled achievements in Canadian power boat racing. Webster’s name is synonymous with Boat Racing in Canada and throughout much of the USA. 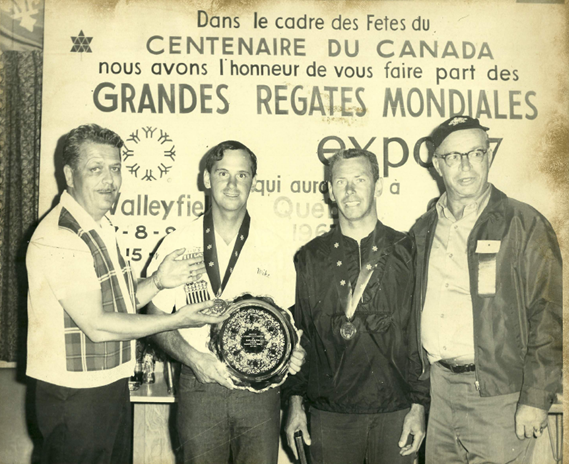 2010 is the 60th anniversary of the Canadian Boating Federation (CBF). The CBF is Canada’s recognized sanctioning body by the World sanctioning body, the Union Internationale Motonautique (UIM) in Monaco. 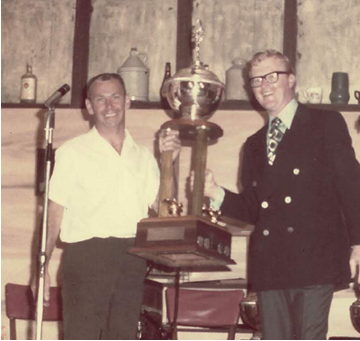 2012 is the 60th anniversary of the Toronto Outboard Racing Club (TORC), Canada’s oldest and largest sanctioned powerboat racing club. John has been a very influential member of both of these groups and in conjunction with these historical organization milestones, I would like to submit Webster’s name to be inducted to the Canadian Motorsport Hall of Fame as someone with a true dominance of a sport and great sportsman and helper to new and experienced members in the racing community. It is without doubt (and you’ll see by reading his stats) I can say John is the winningest powerboat driver of any category or level in all of Canadian boat racing history, and dare I say possibly of any motorsport within Canada. He has also stepped up beyond that incredible achievement to volunteer and guide at the race level as an Official, club level as a President, and Canadian sanctioning body level as a Division Chairman. He also volunteers to work at every racing trade show display we’ve had in Ontario that he’s been available to do so. He has also had tremendous success designing and building racing boats and done some work in the manufacturing of race boat hardware. John is the longest member of TORC, he has been a member since it first began in 1952. 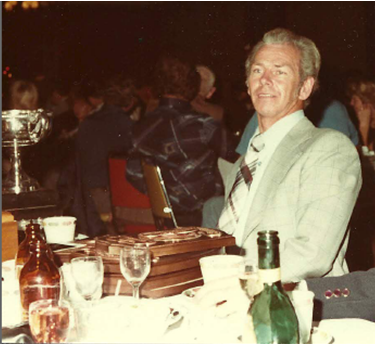 He also helped bring the club to Incorporated status with the government of Ontario in the 80’s and is still a member to this day as the club’s President no less. I believe John is also Canada’s longest CBF member at any level being a steady member 58 of its 60 year history. 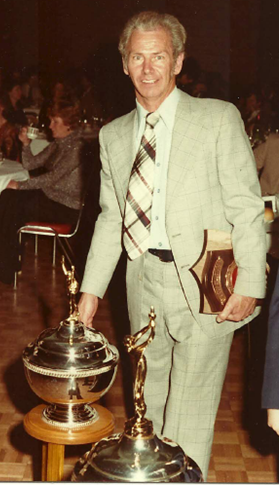 John has won so many Canadian Championships that I can remember when I was young my father laughing and telling me when he started following racing in the late 60’s and into the 70’s that he thought John’s boat number was #1 since it was on all his boats all those years. 5 years straight at that time, and John accomplished this in the largest and most competitive class, Class B Hydroplane. Over John’s 51 years of competition he brought home hundreds of podium wins and many special recognition awards. He’s won enough silverware to dress a mansion’s dinner table. The mind boggling feat though is in his 51 years of driving he won 42 Canadian Championship’s and set 4 speed records in two countries. One achievement John has been chasing his whole career is to win a USA National Championship title. Although he has won many won many podiums throughout the USA, and many Canadian National and High Point Championships... winning on the USA stage at the Nationals has been a goal he never reached. In 2008 it brought tears to the families eyes when John’s eldest son Ross won the USA Nationals competing at Franklin PA in class B Modified Hydroplane. 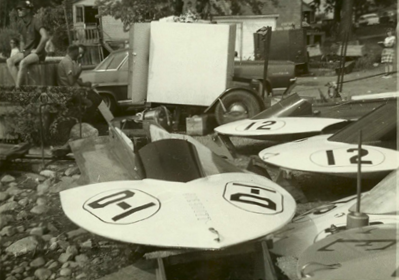 When outboard boat racing had a dry spell in Canada in the early and mid 80’s due to rising insurance costs and other problems, a small group continued to join CBF but race in the USA. John was part of that group and was instrumental along with a few other key people in getting racing back to Canada. A couple demonstration races were held at the CNE grounds in Toronto in conjunction with help from the America Powerboat Association and some of its key members. This gave racing the jump start it needed to get revived in Canada again and racing has continued in Canada since. As John’s career as a race driver slowed slightly over the past 10-15 years, he stepped up in many other ways. He’s been the primary Technical Inspector for all southern Ontario races as long as I can remember and is now training new people to be inspectors for the sport. For the past 12-15 years John has been the lead person in securing race sites in southern Ontario and follows that up with much of the pre race planning and organizing. 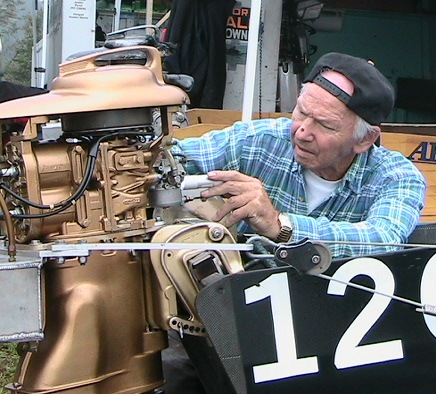 He also lends out some of his historic racing motors and boats to other racers so they can get on the water and experience the thrill of racing the legendary Mercury 20H engines in the still highly competitive and points chasing vintage racing class. experience and still remembers it all as if yesterday. It is rumoured that John will retire from leading the TORC Club as President at the end of the 2010 and I will be requesting approval to retire John’s racing number from the CBF in honour of his career at the 60th AGM meeting in Valleyfield Quebec this fall (if talking to the family, please don’t mention that, it will be a surprise). John still signs up to the CBF and TORC as a racing owner using his #12 racing number and an official. Rotharmel, Theoret, Hayworth, and Woods be inducted to CBF’s Hall of Fame. I believe all of this and more importantly the following stats show that John Webster is true worthy of being inducted to a prestigious group like the Canadian Motorsport Hall of Fame. Thank you for this consideration, and if I you require any other types of information, please let me know. Born Toronto, Ontario March 4, 1933. Passed away rather suddenly in 2012 of cancer. In those 52 years John only missed one year of racing, 1980, due to a major and life threatening accident he was in at the USA Nationals in Wakefield, Michigan. For fear of John getting hurt after a string of minor accidents, the family asked him to retire in 2004, John’s condition was that his son Ross drive John’s outfit in future races and Ross continues to race the outfit to this day in the vintage class along with his own classes of equipment. of the Toronto Outboard Racing Club since it started in 1952 and was awarded an honorary lifetime membership to the club some years ago. 1952 was also the year John built his first race boat. 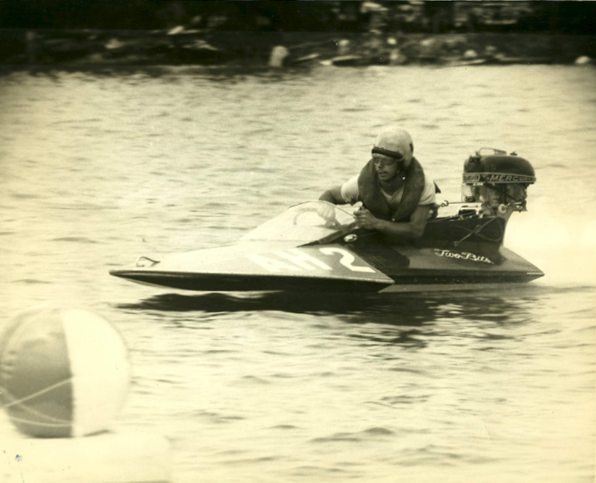 1956 – John has designed, built and raced his own racing boats since then. That year he took 4th place at the USA Nationals with an average speed of 37.847 mph in his boat named “Four Bits”. I believe the class was “A” Stock hydroplane. 1958 – Set USA 5 mile track record, Class “A” Stock Hydroplane, 45.639 mph average, location, Lakeland, Fla *see article about being first person to take record from USA. John was President of TORC for 20 years, 12 years in the past and from 2002 to 2010. 1999 – John was inducted into the CBF Hall of Fame, the hall’s inaugural year. 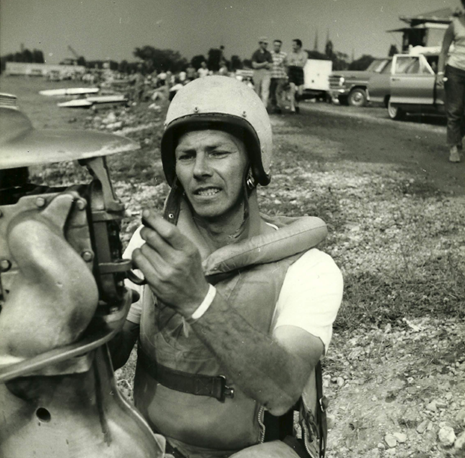 2000 – John was approved as a CBF Stock Outboard Racing Inspector and acted in this position until his passing. At the 50th Anniversary of the USA Stock Outboard Nationals, held at Wakefield Michigan, they held a special race for the old Class B Mercury 20H engines. John won this race. This special “vintage race” was held again another year at the USA Nationals at Hinton, West Virginia, John won this race too. John charging to the first turn in his class "A" Stock Hydroplane named Two Bits. ﻿John's "A" #12, "B" #12, and "D" #d1 boats in the pits. John collecting loads of hardware at a CBF Convention. 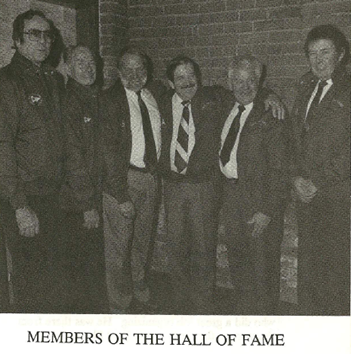 John is second from the left in this picture of the first induction group to the CBF Hall of Fame, 1990.